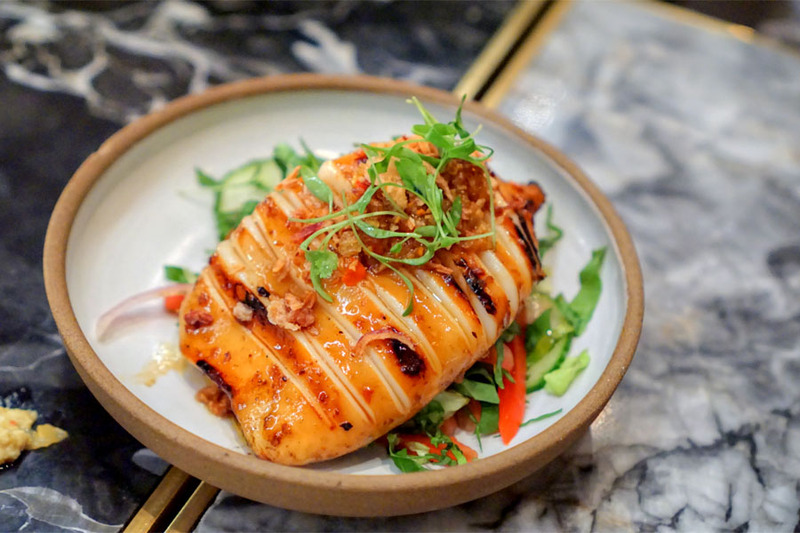 We recently tried to dine at David Kuo's new-ish Little Fatty in Mar Vista, but were thwarted by the surprisingly long wait there. 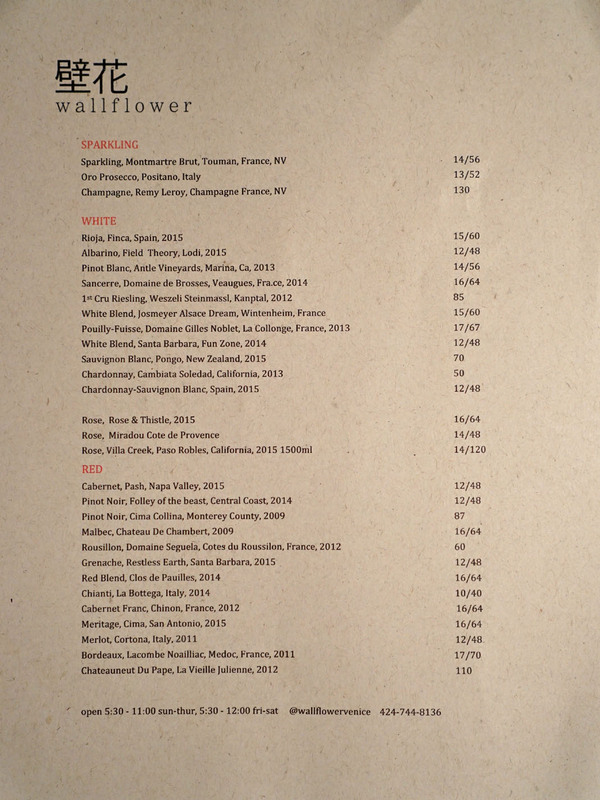 After we realized that there was about an hour's worth of diners in front of us, we decided to cross our names off the list and hit up Wallflower instead, which had also been on my "to-eat" list. 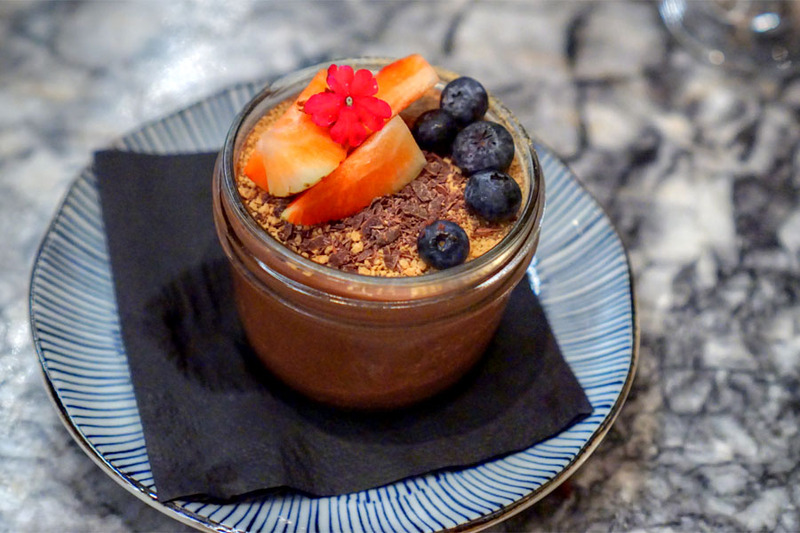 Wallflower bowed at the start of November last year, and is a Southeast Asian eatery that comes to us courtesy of architect Dustin Miles, Wayne Rambharose (Hermanos Coffee, Bar Marmont), and Executive Chef Harryson Tobing. About the Chef: Tobing hails from Bagansiapiapi, a city on Indonesia's Sumatra island. He started out in the biz as a teenager, working at local Chinese restaurants, and eventually attended Akademi Pariwisata Medan, receiving a degree in Hotel Management & Food Production in 2000. After graduating, he started working at the Hilton Dubai Jumeirah resort in the UAE, and in April 2003, transitioned to the Chedi Muscat hotel in Oman. Tobing relocated to the US in July 2004, taking on a position at Cuscowilla on Lake Oconee, a golf resort in Georgia. He stayed there for nearly five years before moving to the posh Amangiri resort in Canyon Point, Utah, where he was sous chef, and later exec sous. His tenure there lasted until July 2014, when he left to start work on Wallflower. Wallflower resides in the former home of the old Ace Trophy Corporation. The space was revamped by Miles and Karin Haase-Sehr and features a cozy-industrial sort of vibe--very on-trend. There's also a heated, covered patio out front. 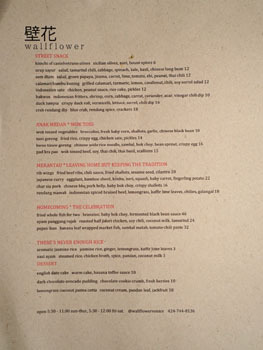 As for the menu, Wallflower presents a variety of Indonesian-inspired dishes of various persuasions, though the Chef does stray into other parts of Asia. There's also a separate brunch selection. 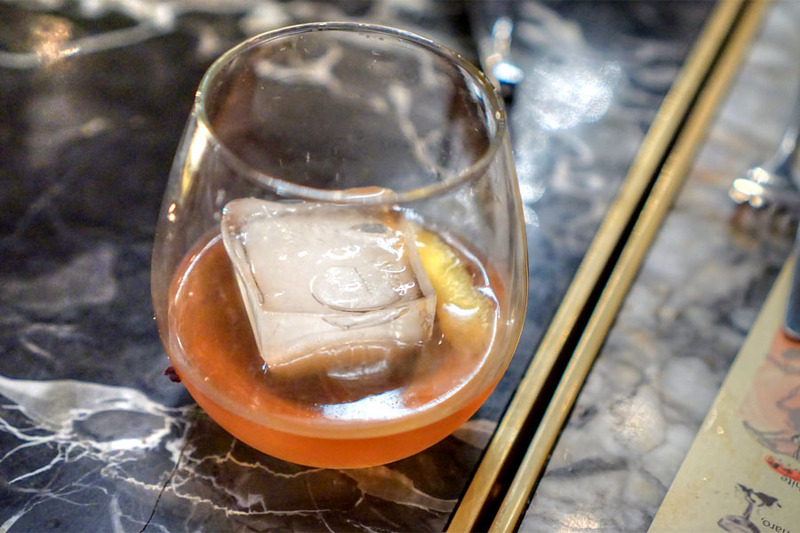 To drink, Beverage Director Steven Shumate (ex-Hotel Shangri-La) has got an appealing list of cocktails, both classic and theme-appropriate, as well as a smattering of beer and a decent wine list. Click for larger versions. When thinking of things to turn into kimchi, Castelvetranos aren't anywhere near the top of my list. 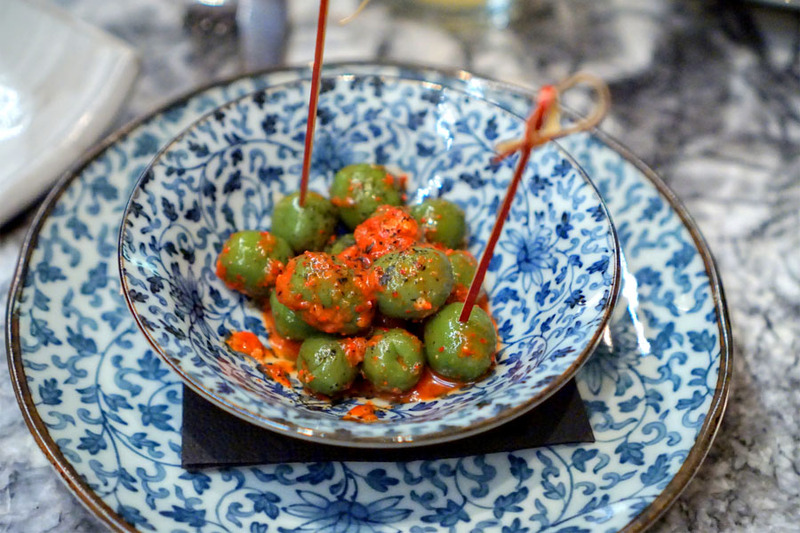 Perhaps they should be though, as they worked swimmingly in such an application, the funk and spice inherent in the process actually combining surprisingly well with the natural piquancy of the olives. 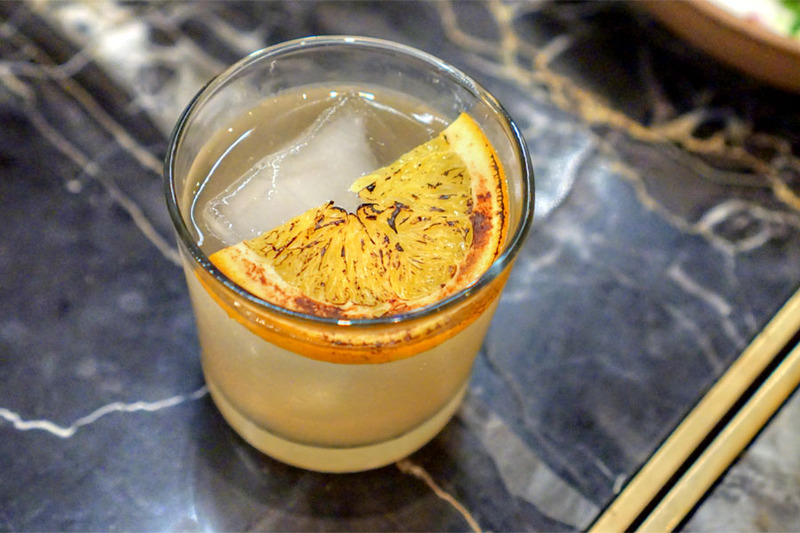 Cleverly named after a traditional medicine of Indonesia, this was a riff on Sam Ross' now iconic Penicillin cocktail. 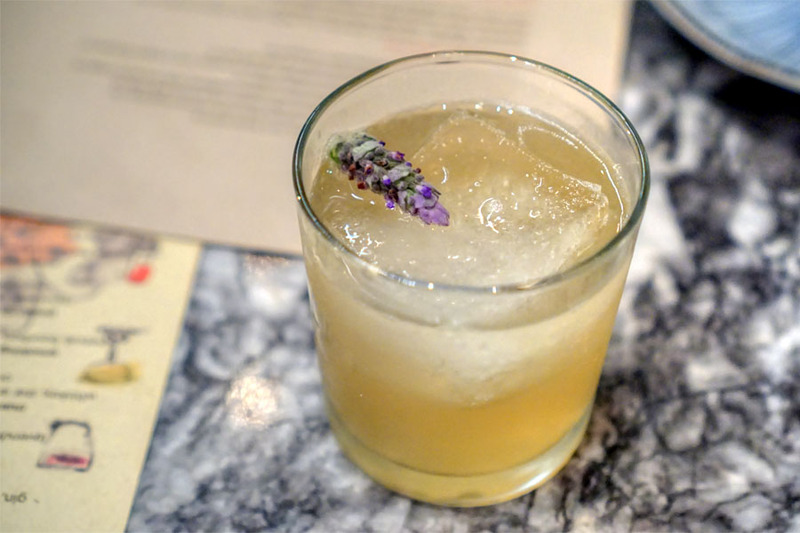 The drink smelled of perfume-y lavender, while its taste went slightly vegetal at first before becoming sweet and citrusy, with the finish giving up smoky notes of whisky. 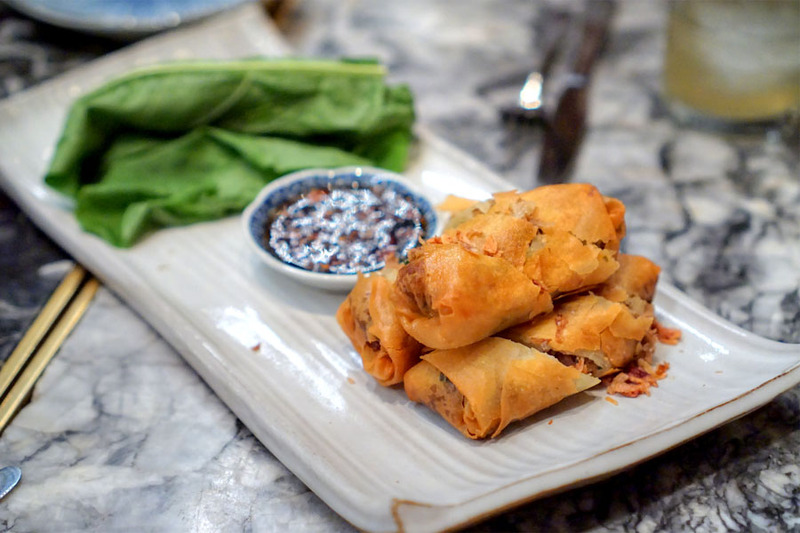 Spring rolls were crisp and flaky, with a delicate, yet distinctly "duck-y" flavor profile that really called for the deep, savory spice of the included sauce. Sorrel wrappers, meanwhile, added a touch of zestiness to the equation. 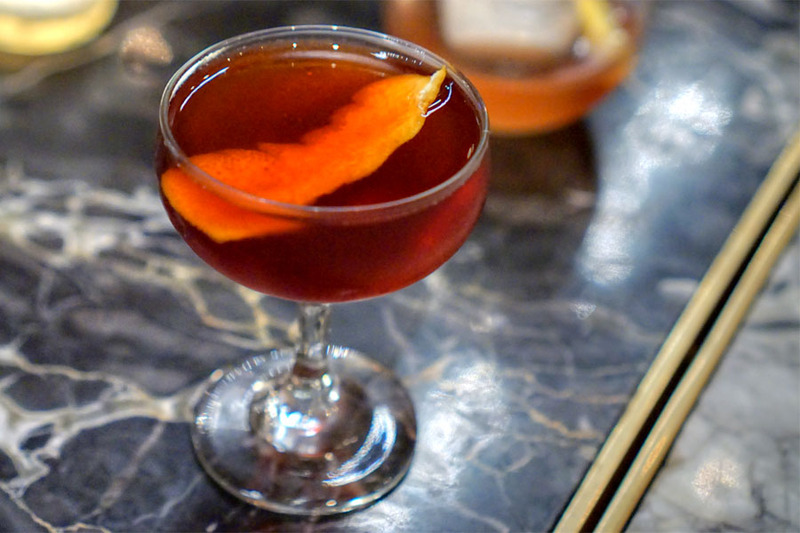 A variation of the classic Manhattan cocktail worked out. The nose was definitely smoky, with a dosing of the advertised star anise. Taste-wise, I got a lot of booziness, along with a bittersweet bent and tons of Chinese-y spice backing everything up. This warm dip was a crowd-pleaser, meshing the sweet brine of crab with savoriness, spice, and a touch of coconut. 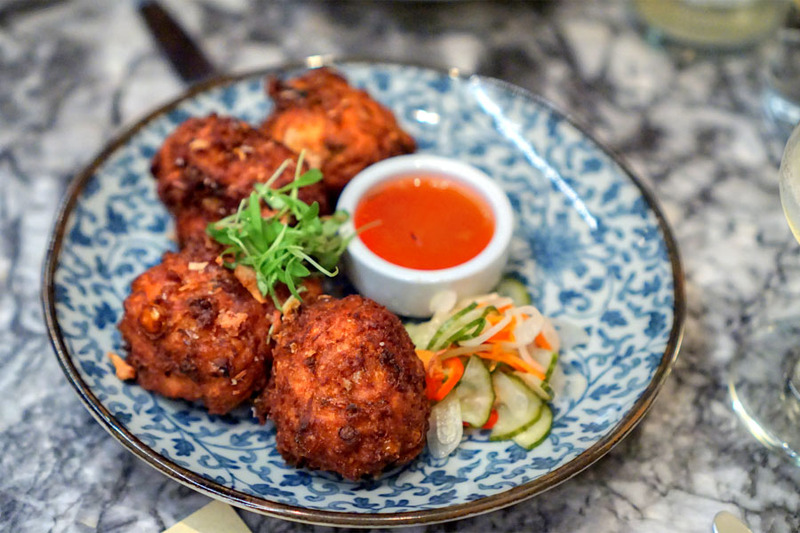 Tasty alone, and even better atop the crunchy krupuk udang shrimp crackers. This next cocktail was my favorite of the ten we tried. I got some super smoky, intense aromas that almost recalled incense, but with a lemony edge. This led to a palate full of sweet, dark fruit and floral notes, along with more smoke, and a sweet, candied finish. The Chef's version of the staple kwetiau goreng was super enjoyable. 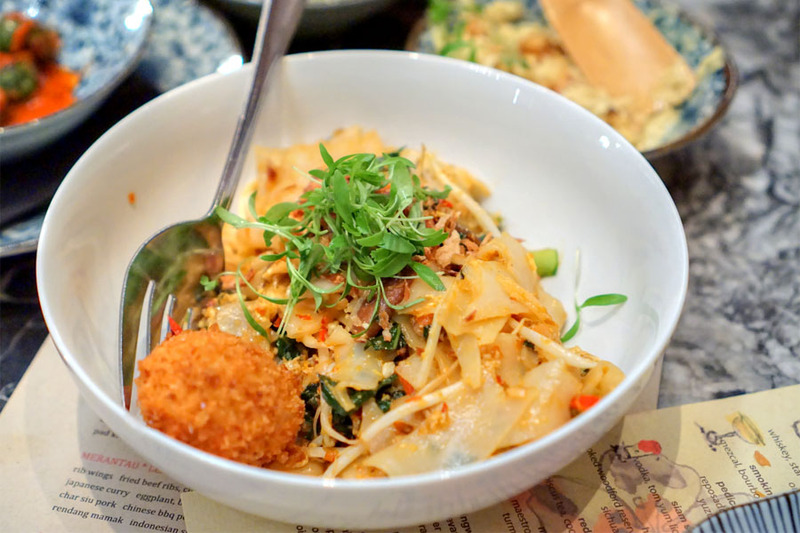 There was sort of a lot going on here, but everything came together in tasty fashion, the soft, slippery noodles serving as a stage for a bevy of spicy, savory flavors punctuated by some well-placed vegetal, herby notes. Meanwhile, the crispy, runny, panko-crusted sous vide'd egg provided an additional lushness to the dish. 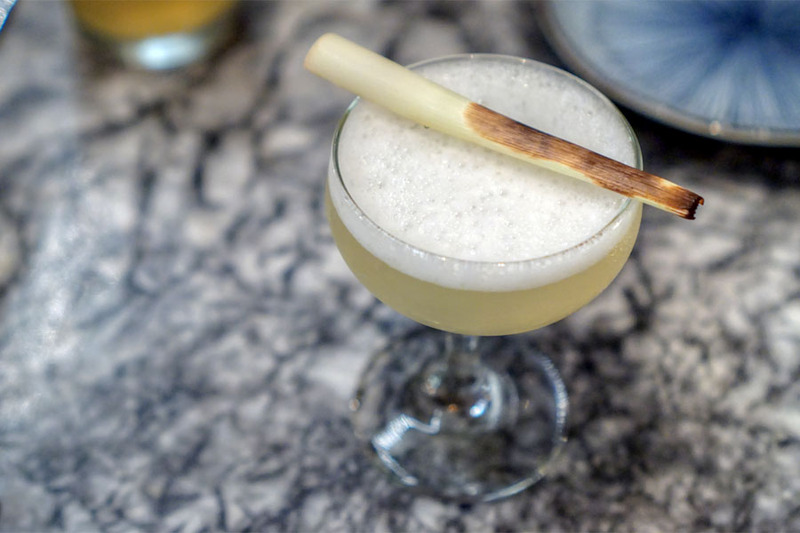 The mezcal cocktail showcased a soft, smoky quality tempered by the frothiness of egg and airy notes of citrus. 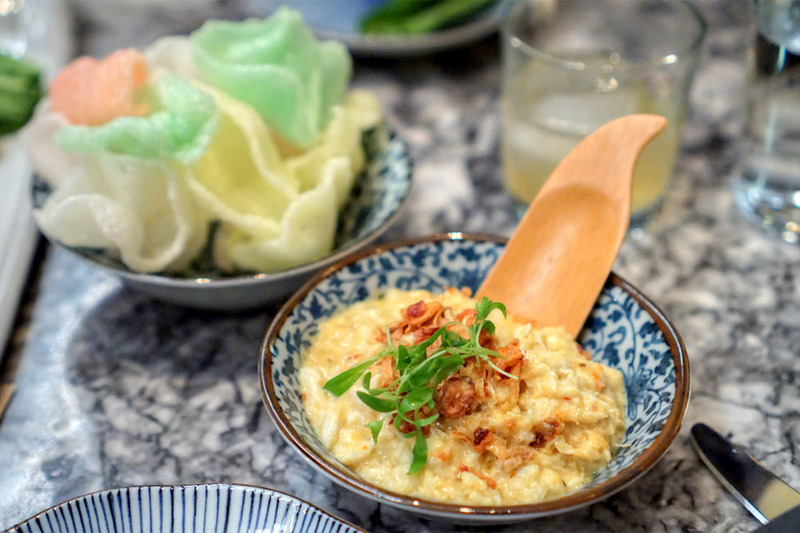 Wallflower's take on the street snack of bakwan jagung was a texturally multifaceted marriage of sweet corn and shrimp. The fritters were somewhat heavy on their own, so the sweet 'n' sour chili dip and pickles really helped lift the dish. This tequila-based cocktail met the mark with its inviting aromas of dark fruit intertwined with warm spice. The taste gave us the punch of the tequila at first, then the bittersweet nature of Cynar, and light notes of tamarind on the close. Calamari arrived properly tender, yet with a bit of snap to it, as well as some pleasant char notes that really highlighted the seasoning on the squid. Nice contrast from the veggies, too. A quaffable yet complex cocktail. 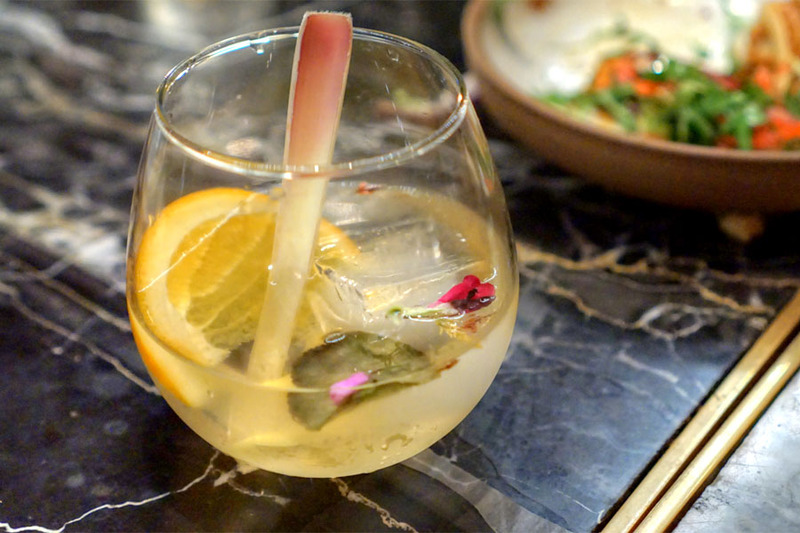 The nose was surprising, giving us a huge spice character that actually recalled Chinese BBQ. Taste-wise, I got bittersweet and herby, along with a floral element and the softness of the pear. 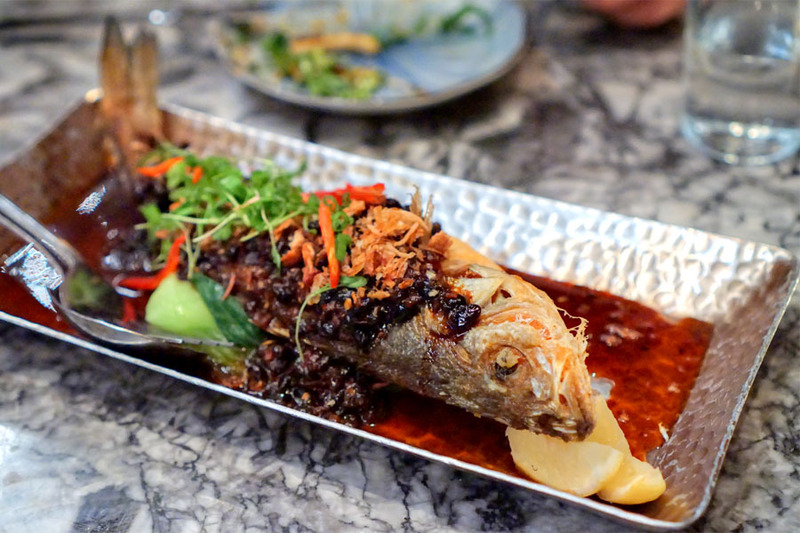 Fried whole, the loup de mer featured a crispy skin hiding soft, juicy parcels of flesh, while black bean added a kick of deep, savory-sweet funk to the fish. This was another cocktail that went down easy. 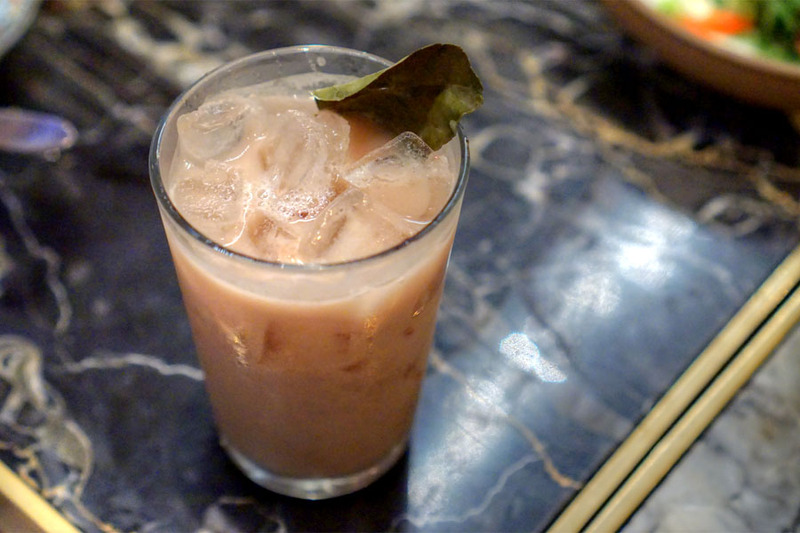 It was a thick, creamy drink, with plenty of soft, sweet flavors, a hint of herbiness, and barely any trace of vodka. I didn't really taste much from the advertised lychee "air," though. 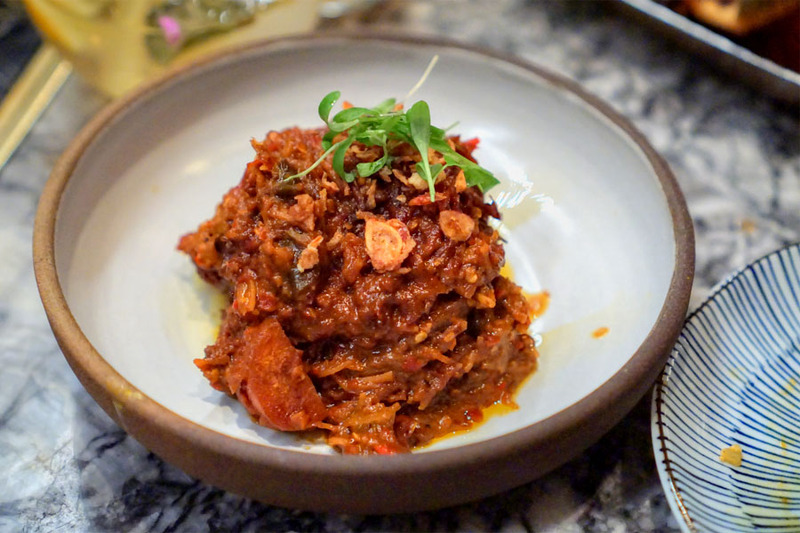 The rendang came out intensely pungent, brimming with a surprising amount of heat that did a great job cutting through the richness of the falling-apart tender beef. Superb when paired with the rice below. 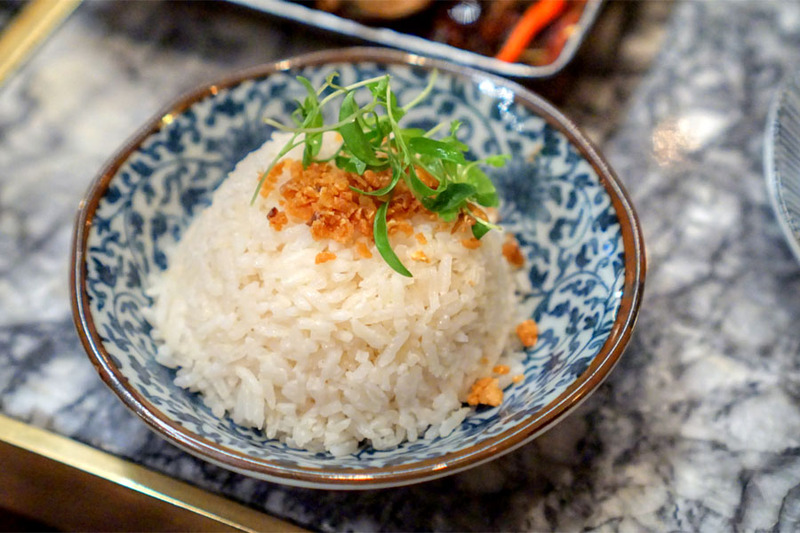 Given the potency of the slow-cooked beef, we ordered some rice to moderate the dish, and this fit the bill nicely with its restrained notes of chicken and hints of coconut-y sweetness. Here was the last of Wallflower's signature cocktails, one that really did a nice job showcasing the Cointreau Noir. I found it a viscous drink, with lots of vanilla and sweet, nutty notes, along with a finish redolent of the advertised five spice. Our final savory was Indonesia's famous take on fried rice, a fragrant, flavorful example packed with sweet-ish savor. The crispy egg and chicken skewer weren't even strictly necessary (the rice easily stood on its own merits), but appreciated. With all the available signature cocktails sampled, we ordered a couple of the classics to finish with. 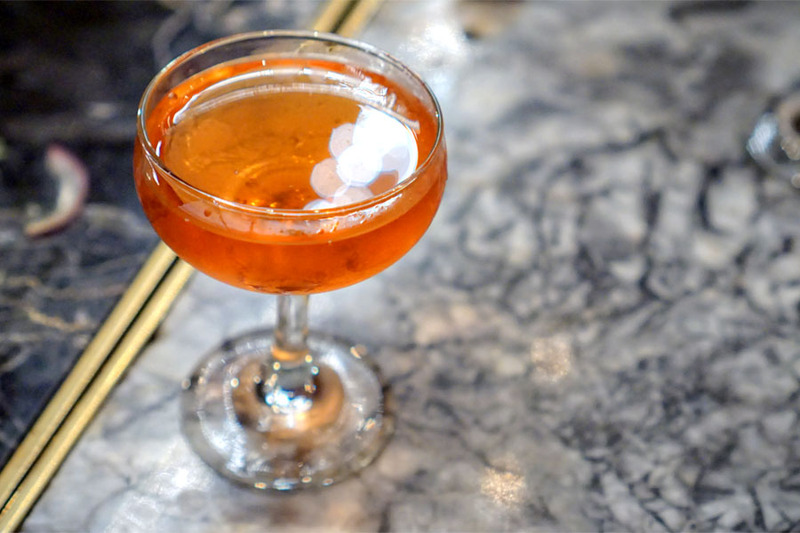 First was the Scofflaw, which typically comprises rye whiskey, dry vermouth, grenadine, lemon juice, and orange bitters. It was a winner for sure. I got an almost strawberry-like sweetness from the grenadine, mixed with bittersweet elements and refreshing, apple-y notes. The pudding ate super thick, super dense, with your traditional chocolatey flavors cut by the presence of avocado, which I wasn't quite sold on. I did appreciate the tartness from the berries on top though, as well as the textural contrast provided by the crumbs. 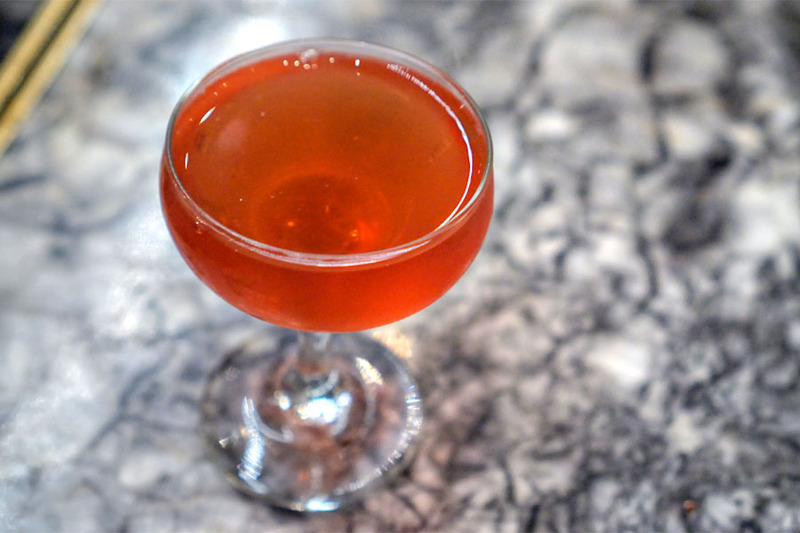 Our final cocktail was the popular Sazerac, which traditionally combines cognac or rye, absinthe, Peychaud's, and sugar. Nose here was definitely boozy, with lots of anise peeking through, along with floral notes from the bitters. 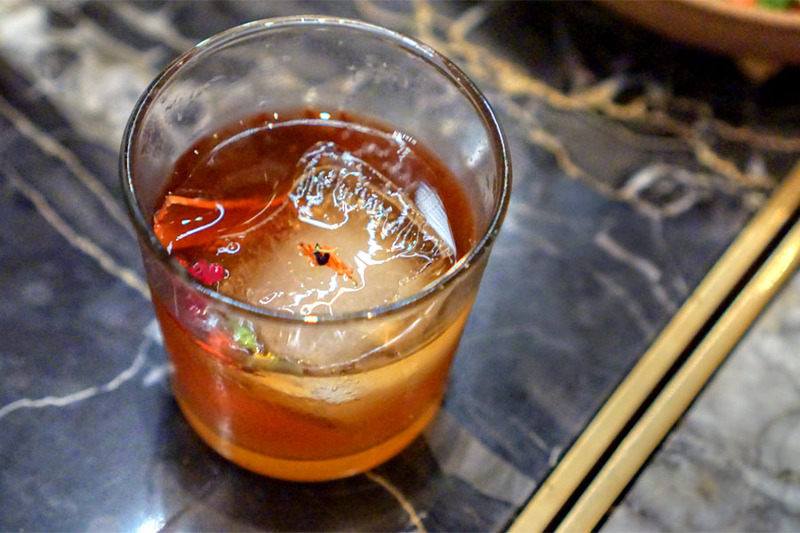 The taste, meanwhile, went decidedly spicy and spirit-forward, backed by a smidge of sweetness. 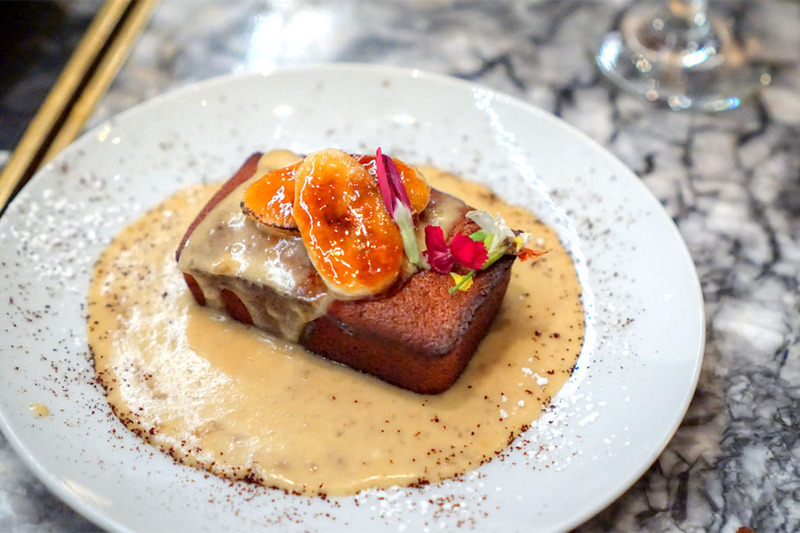 The date cake was my favorite of the desserts thanks to its abundance of rich, sugary toffee and banana flavors. 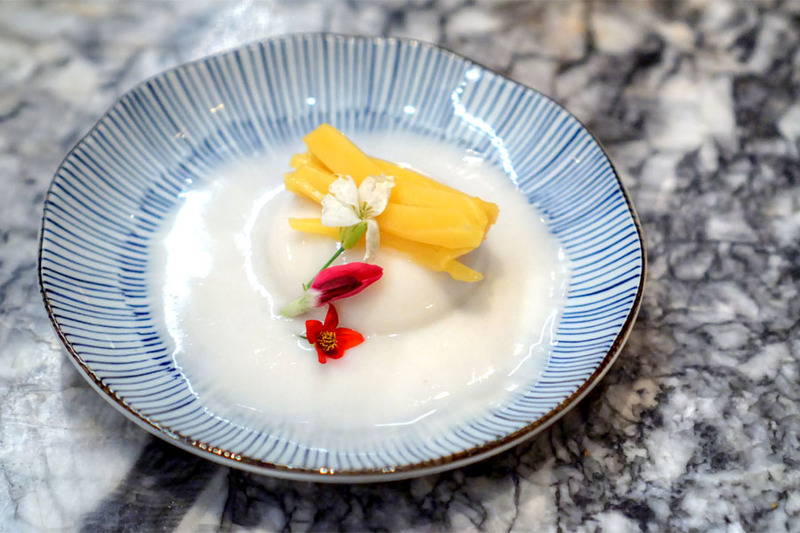 Last up was the panna cotta, which had its strong lemongrass flavors offset by coconut while jackfruit added textural variation and tartness to the mix. 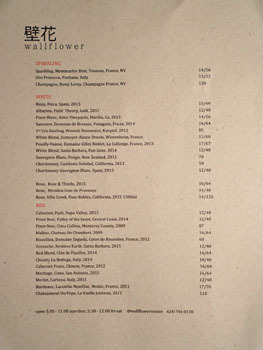 Though we hadn't initially intended on dining at Wallflower this particular night, I'm glad we did. 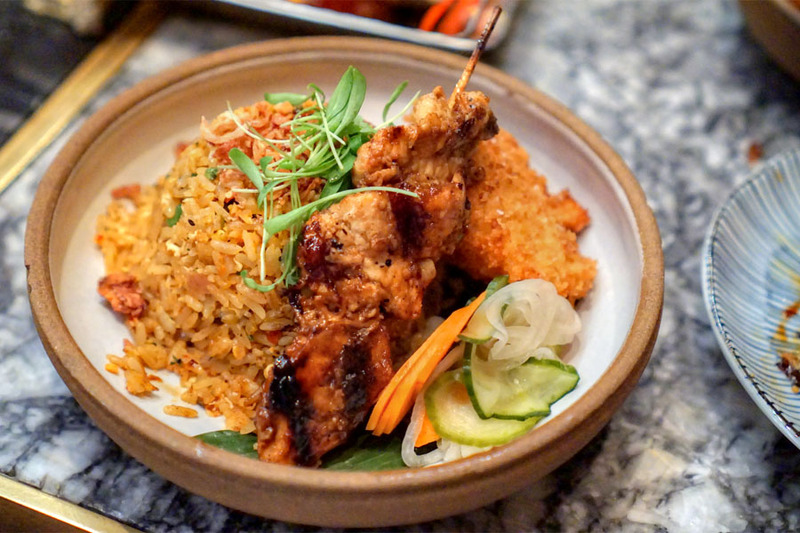 The food was altogether quite good, representing sort of a modern take on Indonesian cuisine, but with some twists perhaps stemming from the Chef's diverse background and travels. It's a type of cooking that's not very well-represented in the Venice area, so I'm glad to see it here. We had some lovely cocktails too, and overall this place is certainly worth a try. Did you eat the fish eyeballs? They are delicious. Thanks for checking this place out! 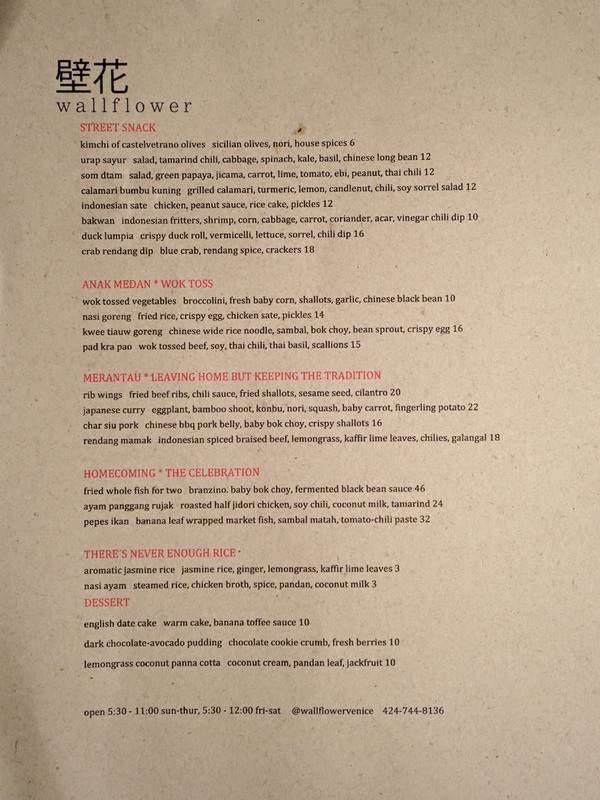 Been meaning to try it - the menu looks awesome, and the place looks fantastic for a date. Keep up the good work! It is very cool to know such information, someday they can be very helpful. Thanks for sending this message.